Sometimes the tricky thing about your reaction to a movie is timing. For example, if I had chosen to watch We are Still Here before I watched Spring - a movie I'll be reviewing in a few days - I feel like the response to the film would be more favorable than it is. Which is not to say that We are Still Here isn't a good horror movie. It is, but at the time I was still quite impressed with Spring, and by comparison We are Still Here felt a little more, not to be unkind, but run of the mill. It's a ghost story that gets a little too busy towards the end, one that starts out strongly and crescendos into a grand guignol finale without really feeling like it needed to. I've seen a number of really positive reviews for it lately, as well as talking to people who liked it a lot more than I did, and maybe I'm just not giving We are Still Here a fair shake. Well, I'll make my case and let you decide - it still comes recommended and I'm certainly open to revisiting the film. Anne and Paul Sacchetti (Barbara Crampton and Andrew Sensenig) are moving into a quiet country home outside of Aylesbury, Massachusetts. Still raw from the death of their son Bobby, Anne is convinced that the house is possessed by his spirit. There are unexplainable events early on, like a photo that he never liked being turned over in the night, or a presence in the basement that takes his baseball mitt. Paul doesn't give it much credence, instead attributing her reaction to grief, and is more concerned when he discovers why this house was so inexpensive. When their only neighbors, Dave and Cat McCabe (Monte Markham and Connie Neer) drop in late one night, they explain that the house once belonged to an undertaker who stole bodies and sold them, before he was forced out of Aylesbury. Paul doesn't put much stock in it, but when a repairman (Marvin Patterson) is seriously injured trying to fix the unreasonably hot basement, the Sacchettis become more concerned that there might be more going on than just a broken furnace. Anne invites Jacob and May Lewis (Larry Fessenden and Lisa Marie) to the house, along with their son Harry (Michael Patrick), who was Bobby's roommate in college. Harry and his girlfriend Daniela (Kelsey Dakota) are arriving later, but Anne is hoping that May will be able to contact the spirit in their house and determine if it's Bobby or not. Despite his good natured appearance, Dave McCabe seems to know more than he's letting on, and Cat tries to warn them to leave the house before they make a hasty exit, mid-cocktails. Paul isn't particularly fond of Jacob and May - they're too "new age" and he doesn't approve of Jacob's fondness for marijuana, but he's willing to go along with it if Anne can find some closure. If We are Still Here was limited to what was in the house, I might have found it more admirable in its focus. Setting the film in 1979 - although it's really not clear that's the case until well into the film - is an interesting decision on the part of writer / director Ted Geoghegan. It only really settles one question, which is why Harry and Daniela don't make an effort to find their parents or the Sacchettis once they arrive. They find a note and decide to stay at the house, which of course ends as one might expect in this film. Without cellphones, it's obvious why May and Jacob don't investigate much into their non-arrival, but beyond that the film seems to be a throwback mostly for aesthetic purposes. It's not unlike The House of the Devil, but in the ensuing years, making films set in the late seventies or early eighties is suddenly "in vogue." I'm not really holding it against We are Still Here, but at this point I'm not convinced that it services the story in any way. To say much more about the plot means going into SPOILER territory, so consider yourselves warned. I can't really get into the (mostly minor) issues I have with We are Still Here without discussing the spiritual activity, and the other part of the film, so SPOILERS FROM HERE ON OUT. You have been warned. So, it turns out that it's not Bobby's spirit, but that of the Dagmars, the undertaker's family who weren't so much run out of town as burned alive in their home by the townsfolk. The Dagmars aren't even really behind the evil, because the house was built over an ancient evil that requires a sacrifice every thirty years or all of Aylesbury will fall into a state of plague. We learn this when Jacob decides to hold a séance without May (she's in town with Anne) and he's possessed by the spirit of Dagmar, which leads to one of the most distracting performances from Larry Fessenden I've seen. From the moment I first saw him in We are Still Here, I wondered why Fessenden was making a conscious effort to physically resemble Jack Nicholson in The Shining. It turns out that's because once he's possessed by the house, Fessenden goes full on Jack Torrance for the remainder of his time in the film, and I'm not convinced that's for the best. He's reasonably subdued earlier in the film, as is the almost unrecognizable Lisa Marie, who I hadn't seen since Tim Burton's Sleepy Hollow. But once Fessenden's resemblance to a famous horror performance becomes a channeling of Nicholson, it began to chip away at the film. More of an issue is that not only does the house require a sacrifice, but the whole town knows it, and when our central protagonists are in Aylesbury proper, everyone other than the duplicitous Dave McCabe is so hostile towards them that it's impossible not to know something conspiratorial is shaping up. Still, I didn't expect an all-out assault on the house by the townspeople in the climax of the film, which turns We are Still Here from people vs ghosts to people vs people vs ghosts. It's not hard to guess how things are going to play out as a result, but I'm still a little iffy on the confrontation between Dave and Dagmar. What gets lost, mostly, is the significance of the house, and instead the focus shifts to whether the Dagmars (who I thought were supposed to be representing the spirits that require a sacrifice) have some sort of agency to punish the townsfolk for something I thought they wanted - to become part of the house. The whole sequence unnecessarily complicates the lore of the narrative, so while the extra (some might say excessive) gore is appreciated, I think We are Still Here would have worked just as well without the histrionics. 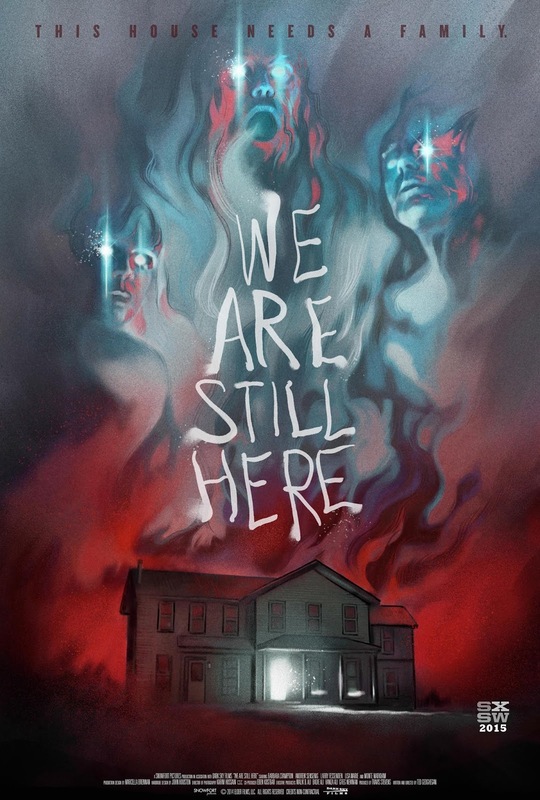 And yet, for the first 2/3rds of the film (at least up until the first séance), I enjoyed the atmosphere of We are Still Here. It loses steam in towards the end, but the slow build up and mystery about what's going on (admittedly spoiled by any synopsis you can find online, including IMDB) is worth investing time in. Crampton, Sensenig, and Lisa Marie are quite good, and Monte Markham seems to be having a great time as the duplicitous McCabe. His scene in downtown Aylesbury with Lisa Marie and Barbara Crampton later in the film is great, and even when things fall apart at the end, he almost holds it together. Since you can see it just about anywhere at a very reasonable price (to rent or own), it's hard to not recommend it, with the caveat that I really only enjoyed the setup. Not so much the payoff. Sometime in the near future, I'll give We are Still Here a second chance, without the unfair comparison to a film I found much more satisfying, and perhaps I'll come around. This has been a good year for horror films flying under the radar, and for that alone, We are Still Here is worth your time.